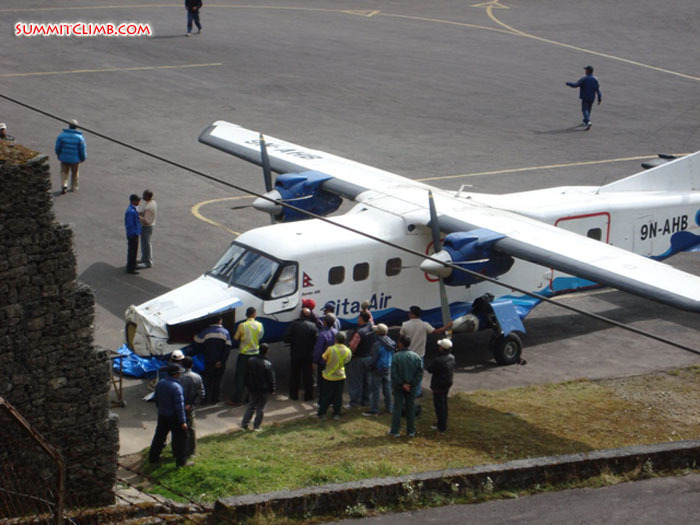 Trip Summary: : Our team flew on a wee 16 seat propeller plane to Lukla. Along the way we had superb views of the snowy mountains, green foothills and river valleys. Upon reaching Lukla we trekked for a few hours up to the first village and rested for the remainder of the day. For the next few days we slowly walked ever higher through little hamlets and stopped for a few nights here and there. Our staff setup comfortable tents and made us lots of delicious food and hot drinks. The trail was quite steep and we took our time. It was a quick pace of acclimatization. I think everyone took diamox. Finally we climbed above the treeline and crossed the gorgeous Zetra La pass at 4600 metres/15050 feet. This is a stunning alpine setting, with rocky spires jutting from an undulating grassy rocky ridge. Finally we climbed down the other side of the ridge and came to the group of teahouses called Chetra at 4200 metres/13,800 feet. Chetra is an above treeline alpine village. The following day we went all of the way down into the Hingku river valley to Kothey at 3500 metres/11,500 feet. We saw a gorgeous primeval uncut forest, a tribe of giant white monkeys, a lush rainforest, lots of steep moss covered cliffs and the rushing Hingku river. The following day we had a relaxing trek up the river valley to Tagnag at 4300 metres/14,100 feet. Once again we were above treeline, and now we could see the icy snowy walls of Mera Peak rising high above us. we rested and acclimated here for a day, then moved up to Khare at 5000 metres/16,400 feet where we had another rest day and wandered around this high village on the flanks of Mera Peak. Next we crossed the Mera La pass, and went down to Lower Mera Peak Basecamp at 5100 metres/16,700 feet. Along the way we passed a rather freezing and unpleasant looking upper Mera Peak basecamp, where we saw some groups huddling on dirty snow. We could not figure out why they were camping there when there was a more pleasant basecamp just 30 minutes further on. Lower Mera Peak Basecamp is gorgeous, on the edge of an alpine lake, and we were the only group camped there. Next day we practiced our ice axe and crampon skills and learned how to ascend and descend fixed ropes on a 7metre/23 foot high ice wall. It was a really fun day and we became further acclimated and ate some very tasty food. The next day we walked to Mera high camp at 5768 metres/18,978 feet and our sherpas cooked a nice meal, filled all of our water bottles and put us to bed early. In the pre dawn hours, we walked to the top of Mera peak, and the sun came out along the way, and we could see Everest and Makalu, the fifth highest peak in the world and even see Kangchenjunga, the third highest, which must have been about 100 kilometres away. The going was not too steep, and it was basically a long snow hike. There was a short steep 9 metre/30 foot high snowy pyramid at the very summit, and after our skillful sherpas fixed a rope there, nearly everyone summited! Mera was a great challenge and the weather was beautiful. What a treat to be on top of this 6500 metre/21,300 foot high peak on such a glorious day! After many photos of the surrounding beauty, some of our madder members opted to ski down!! The rest of us walked down to Kare, and then over the next few days made our way, with a guide, back to Lukla for the return flight to Kathmandu. Overall I thought this was a very challenging trek and trekking peak. 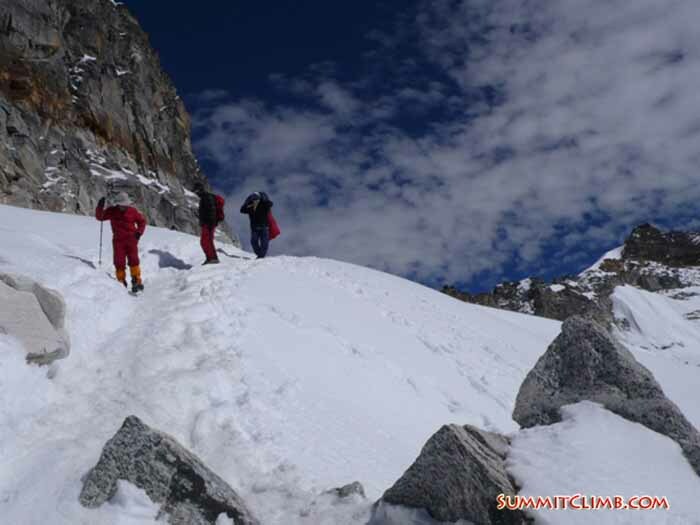 We did a lot and learned a lot during the trek, and the walk up Mera peak involved a bit of mountaineering. I especially enjoyed the remote feel of the area, its undeveloped nature, and the wide variety of terrain and environments we experienced. Leader spots from below while a team member climbs the final headwall to the summit and Jangbu, chief sherpa, gives a thumbs up. Members on the summit of Mera Peak with Everest and Lhotse behind. Team member coming back from summiting the main peak. 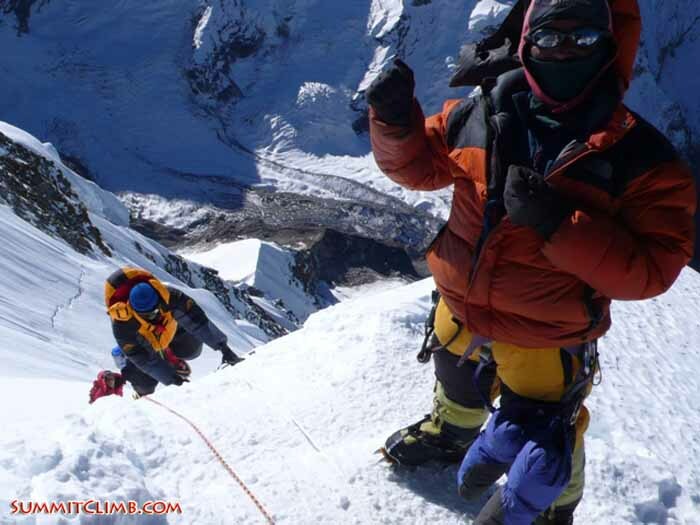 Team members ascending the main summit of Mera Peak on ropes fixed by our strong sherpa team. Climbing on to the Mera summit plateau. 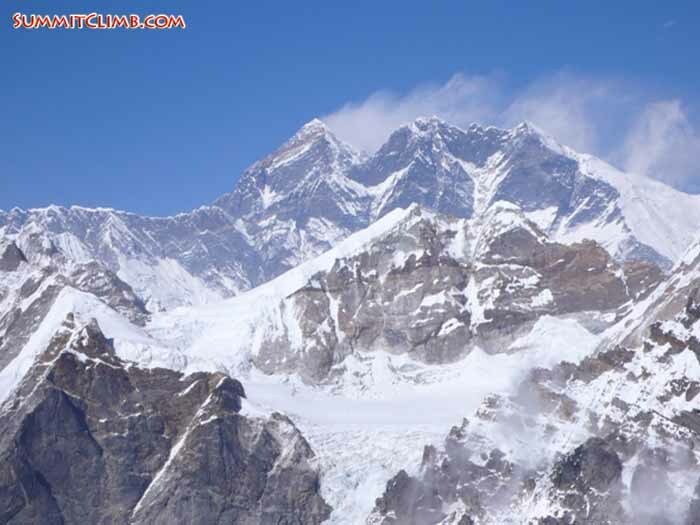 Peaks behind include Ama Dablam, Nuptse, Everest, Lhotse, Island Peak, Baruntse, Makalu and Chamlang. 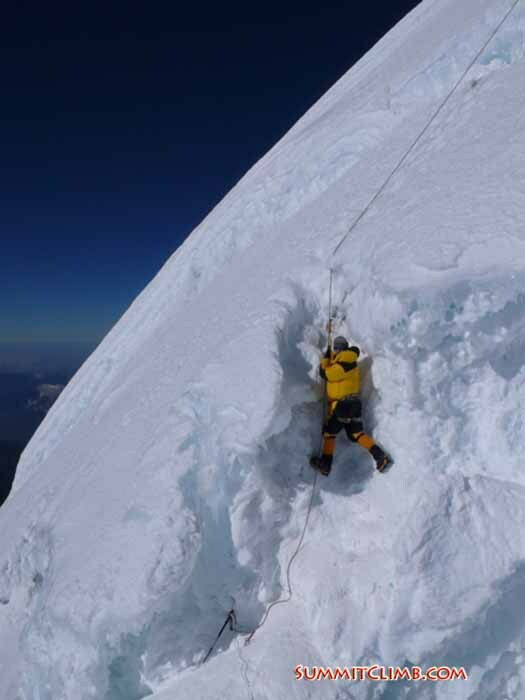 Team member shows his style climbing out of the crevasse just below the summit onto the head wall. Waiting for the kitchen to boil more water to fill that big cup in Mera high camp.That's Baruntse, the huge brown mountain in the back left of centre. If you follow the ridge down toward the centre of the photo with your eye, you can see the famous west col about 200 metres high (Dan Mazur). Hello, this is Mike Browder from Chamonix, leader of the Mera Peak/Baruntse SummitClimb expedition with a special dispatch for October 23rd. I’m going to interview Dan Mazur, who skied from the summit of Mera Peak yesterday. Mike: So Dan, what’s like to ski Mera Peak anyway? Dan: Thank you Mike. I just would have to say that skiing down from the summit of Mera Peak, which is 6500 metres/21,450 feet high, is one of the most amazing things that I’ve ever done in Nepal. It was an incredible experience with great weather and great snow. It was very challenging and super exciting. Mike: What were the conditions like? Was it the same from top to bottom? Dan: Oh yeah, the snow conditions. They were really quite variable. On top it was fairly wind blown up there. It was kind of a windy day. Then as I got further down into this high valley that dominates Mera Peak, the snow got a lot better and it was actually quite powdery and really fun. There were occasional slight wind layers there, but it really wasn’t too bad. Once I got to the lower part of the mountain there was nice soft and turnable snow. When I got lower to the very bottom I got into a shadowy area down around 5200 metres/17,000 feet I decided I would take off my skies just to be safe. Mike: What was the snow angle like? Were there any particularly dangerous elements or was it all pretty much crusiing from top to bottom? Dan: Great question Mike. Thank you. The slope angle I’d say was around 20 degrees. I would describe it as intermediate terrain. One of the unique features of Mera Peak was there were a few crevasses up there that I had to ski around, so I had to really be careful and keep a good lookout. Another thing is that we hiked up the route earlier that morning, the same route I would ski down, so I kind of remembered and made some mental markers and kept good track of the crevasses that I’d have to look out for on the way down. Mike: Did you find it difficult to breathe while you were skiing downhill or was it pretty easy? Dan: Oh my gosh, that’s a great question. 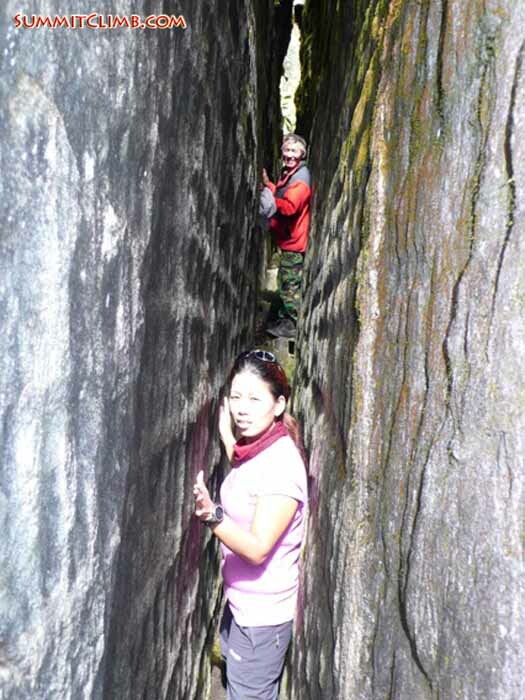 Yes, it was really tough to breathe on the way down. I had to stop and catch my breath because when you’re skiing around above 20,000 feet/6500 metres, wow, there’s just not a lot of air to breathe. Another thing though that was really a surprise was it was quite cold when we got to the top and I had all of my down clothing on. When I started skiing down I immediately got really warm and I had to take off all of those layers. I was skiing down while my friends were hiking down. My friends were all these heavy thick layers and I was skiing down in just windshell gore-tex and really enjoying that. Mike: It sounded like you hiked up? You didn’t have to skin up or how did your skiis get to the top of the hill? Dan: I must say that I’m deeply indebted to our incredibly strong sherpas who carried my boards all the way to the top and I’m kind of embarrassed because as a old school back country skier I know that you’re supposed to carry your own equipment and skin up. But hey, we’re in Nepal. There’s a lot of really friendly, skillful sherpas around and they’re super strong, so I can’t really can’t complain. My boards were carried to the top for me. Mike: How many metres or feet did you ski down then? Dan: I started skiing down at 6500 metres and I took out my skiis at around 5500 metres, so I skied a 100 metres/3300 feet of vertical terrain. It was a long descent. It really took me a longtime. I stopped in the middle for about a half hour. I had to stop a lot to catch my breath. It took me a few hours, not including breaks. Mike: Let me ask you about equipment. What equipment did you use to ski and do you think me, as a snow boarder, I could have done the mountain? Dan: Thanks Mike, that’s a good question. I used light weight all mountain powder skiis. These happen to be made by K2. They were a test ski from Vashon Island that I received from my friend Rainer Eckhart. I used Scarpa mountain alpine touring boots. So I was not telemark skiing, I was skiing down in downhill style. As a snow boarder, I think it would have been excellent. In fact, as a snow boarder you would have been able to go further down the mountain than I did because snowboarding is so good in variable snow conditions. I think you would have loved it. As a snow boarder, I think you would have especially loved having the sherpas carry your snow board to the top for you. Mike: Would you recommend this? Was it fun? It sounds like it was a blast to me. Dan: I would definitely recommend this to people that love high adventure, mountain skiing in the Himalaya, mountain snowboarding, people that love Nepal, and love going to remote areas because it took a week to get to the base of the mountain. Now we’re going on into some other valleys, so I just think it’s an all out great adventure with really fun skiing on a super high altitude mountain with amazing views of Mount Everest. What an incredible special thing to be able to be skiing down a mountain looking straight over at Mt Everest a few kilometers away. Mike: What did you do when you were finished? Did you celebrate? Dan: Oh yeah Mike, that’s a great question. We had kind of a ski party down in basecamp with some really delicious food excellently prepared by our awesome cooks with things like vegetables, pasta, delicious steaks for the meat eaters, and lots of hot drinks. 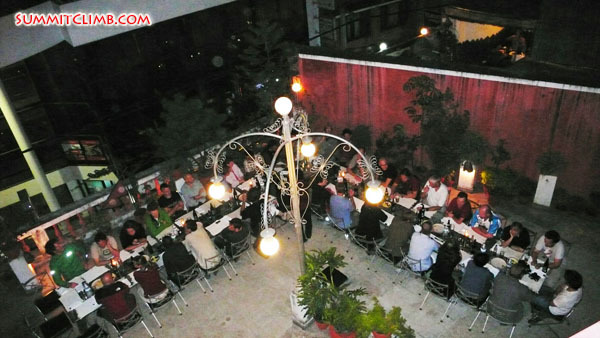 It was a great fun time reliving the day’s memory around the table in basecamp. That was just a really fun way to wind up the day. Also, we descended to quite a low elevation to 5200 metres/17,000 feet where the air is so much thicker and easy to breathe. Mera Peak as seen from the Mera La trail and climbers visible on the lower section. Hi, this is Felix Berg with a dispatch on the 24th of October for the SummitClimb Mera Peak/Baruntse expedition. 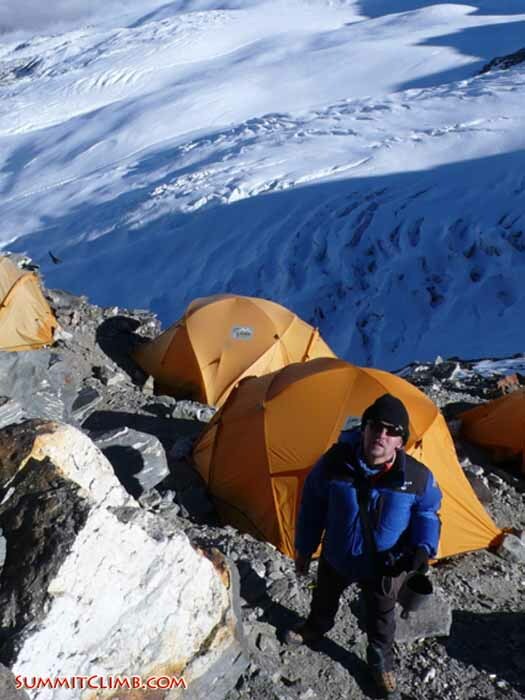 We’re sitting here in Mera Peak basecamp at about 5200 metres. Everything is packed up and we are going down the valley to Baruntse basecamp now. 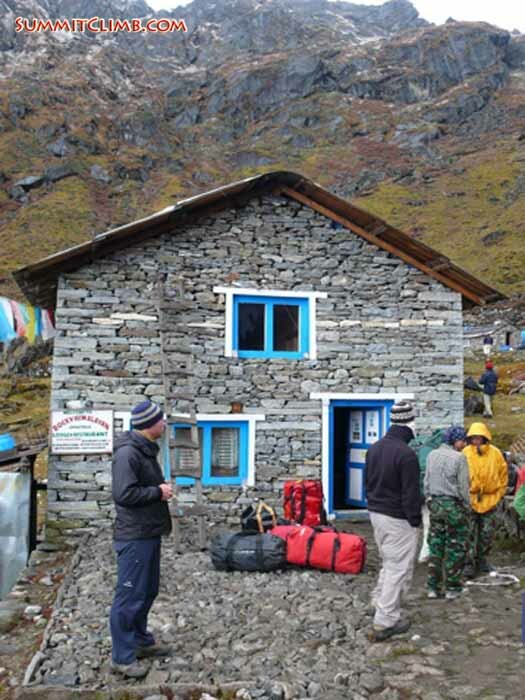 We also sent 1 porter with about 30 kilos of rubbish back over to Lukla to keep everything nice and clean here. 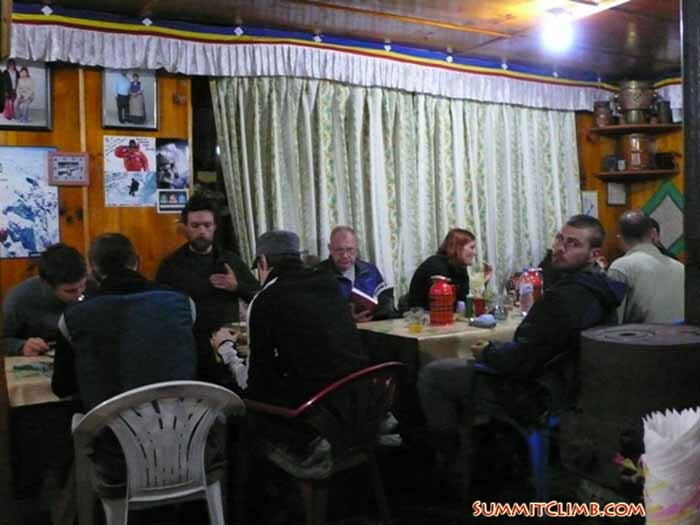 Hi, this is Dan Mazur with a dispatch on the 23rd of October for the SummitClimb Mera Peak/Baruntse expedition. We’re on the central summit of Mera Peak! It’s 9:30 in the morning. It’s a very beautiful sunny day up here. Almost all of the members made it. We’re so proud of them. They did a great job. 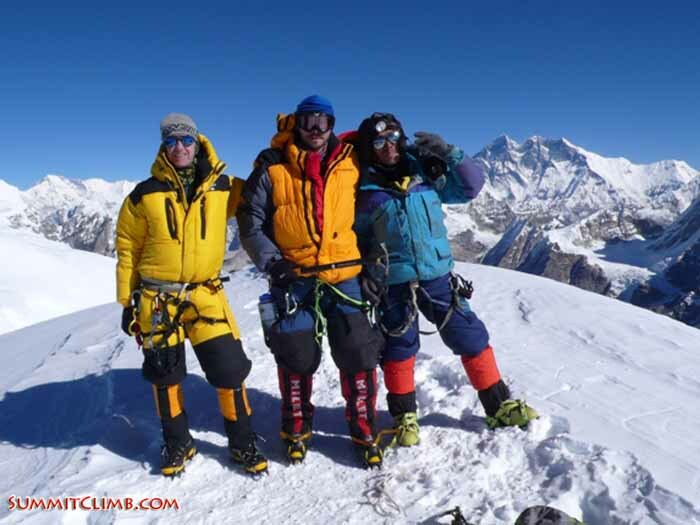 One of our members, Lars Ronnevig, went to the main summit of Mera Peak with 3 sherpas. That was an amazing thing he did in some very high winds and icy conditions. The rest of us still summited only a few metres below the main summit. 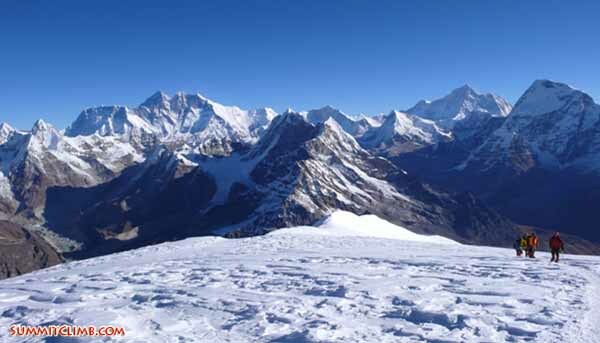 We can see stunning views up here of Cho Oyu, Pumori, Ama Dablam, Nuptse, Everest, Lhotse, Island Peak, the Amphu Labtsa, Baruntse, the west col, Makalu, Chamlang, and all the way over to the east we can see Kangchenjunga. I think Mera Peak has some of the finest views of any mountain in Nepal and particularly excellent views of Mount Everest. Well, today is a big day for us. Luckily the weather seems to be stabilizing and returning to normal, which means we have sunshine in the morning and clouds and light snow in the afternoon. 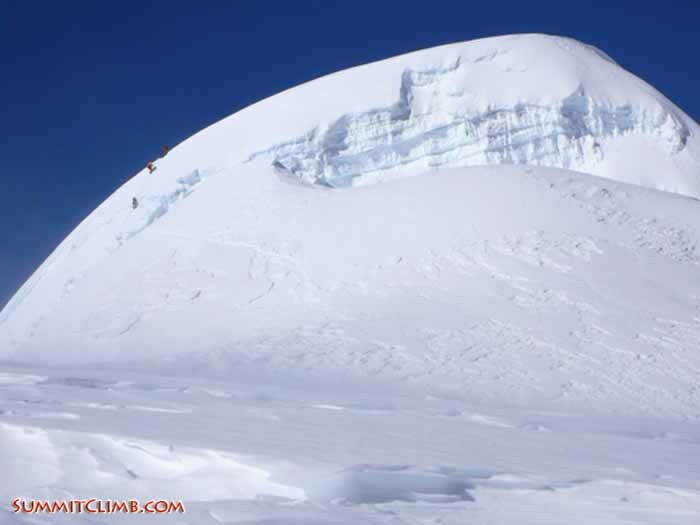 Today our Mera Peak team of 4, together with our Baruntse team of 22 are heading for Mera Peak high camp at 5700 metres. People are in high spirits and surprisingly, everyone is feeling well enough to proceed to the high camp together with 20 sherpas. Big windstorm hits Everest in centre of photo.Team practicing ice climbing on the glacier above basecamp. 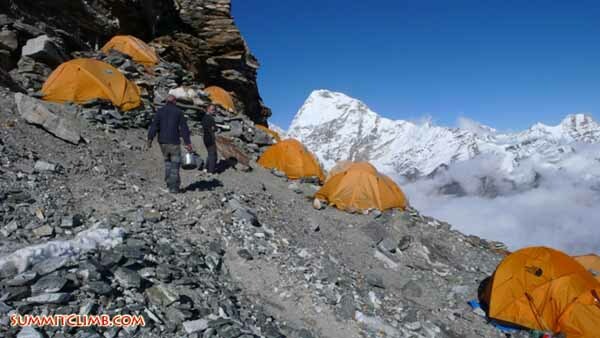 Mera Peak high camp is perched on a gravelly ledge at about 5765 metres/18,900 feet behind a large rock outcropping. It's fairly sheltered from the winds that seem to come from the north (Dan Mazur). 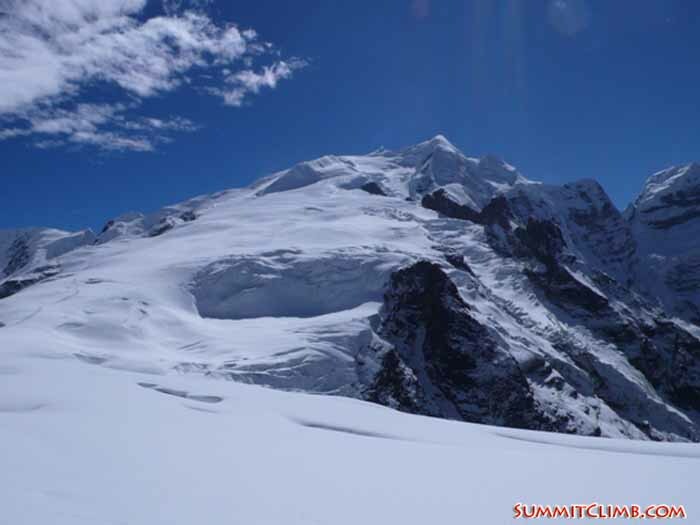 Hi, this is Dan Mazur with a dispatch on the 20th of October for the SummitClimb Mera Peak/Baruntse expedition. On the 17th of October we walked from Kharte to Tagnag. It was raining really hard. 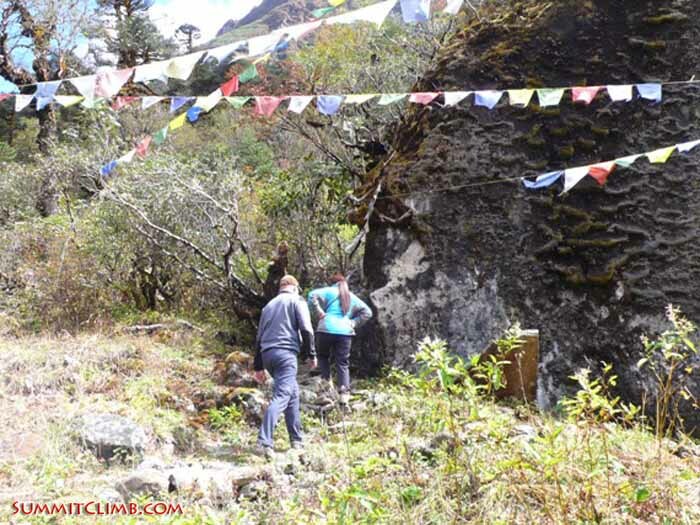 On the 18th of October we walked from Tagnag to Khare, which is at about 4900 metres/16,100 feet. We had beautiful weather, but it started to snow late in the afternoon. On the 19th of October we took a rest day in Khare. It was a very beautiful day. It was sunny with a little bit of snow in the afternoon, so it looks like the weather is kind of normal. We heard one of our members, Fred, got a helicopter from Tagnag, which is good. We also found a local Nepalese woman who had apparently had a miscarriage and we were luckily able to put her in the same helicopter and get her to the hospital in Kathmandu for an examination. We really miss Fred and we hope he gets better soon. It’s the morning of the 20th of October now. We’re in Khare. It’s a really important day for our expedition because half of our porters are going down. They’ve done their job and carried their loads up here. 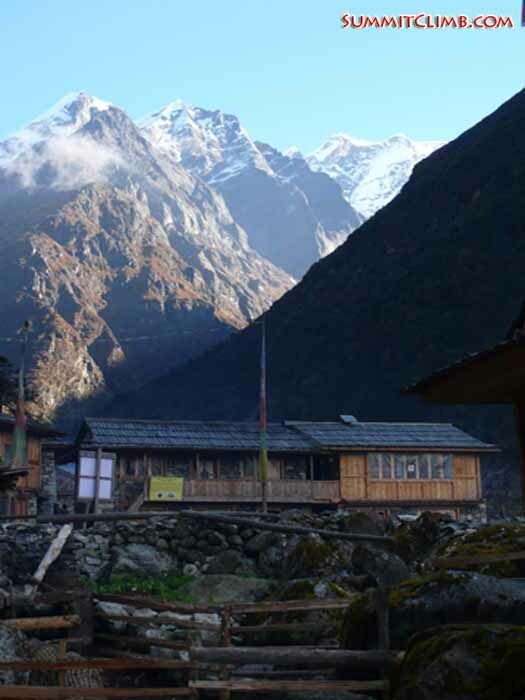 All of our members are going to cross the Mera La, which is a 5400 metre/17,700 foot high pass, together with all of our remaining porters and sherpas. 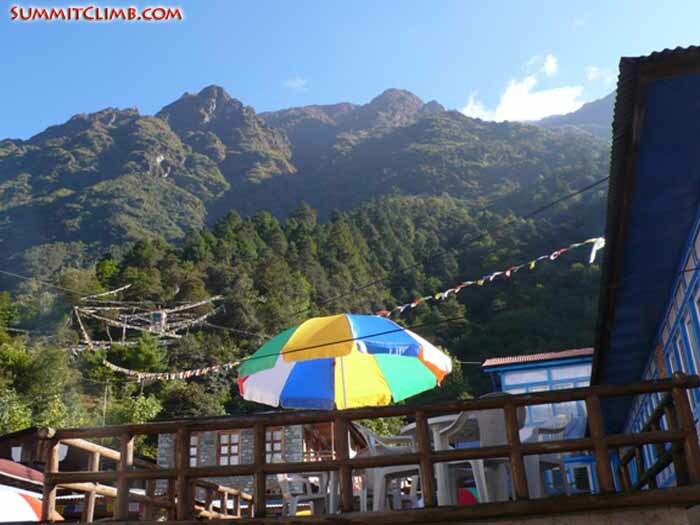 We’re going to Mera Peak basecamp, which is on the other side of the Mera La at 5200 metres/17,000 feet. It’s a beautiful morning here. There is no wind. It’s very sunny with a few puffy clouds blowing around, but it’s a really gorgeous morning. We’re really looking forward to getting over the pass. Friends walking down the Mera La. Heading down toward our Mera basecamp. 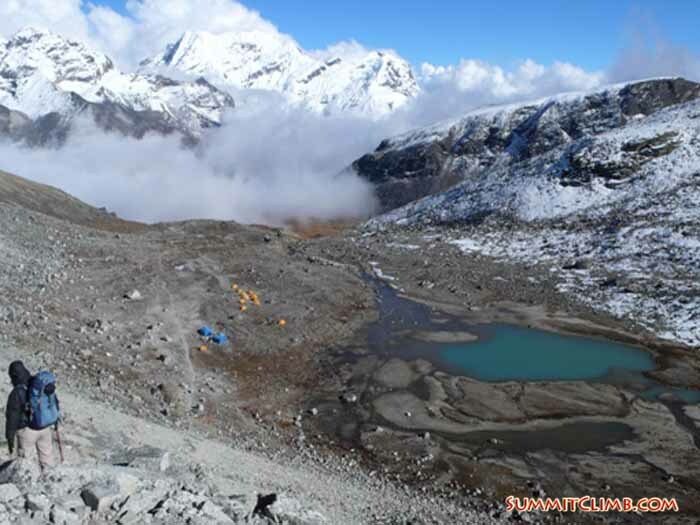 See the tents by the lake at 5089 metres/16,700 feet? 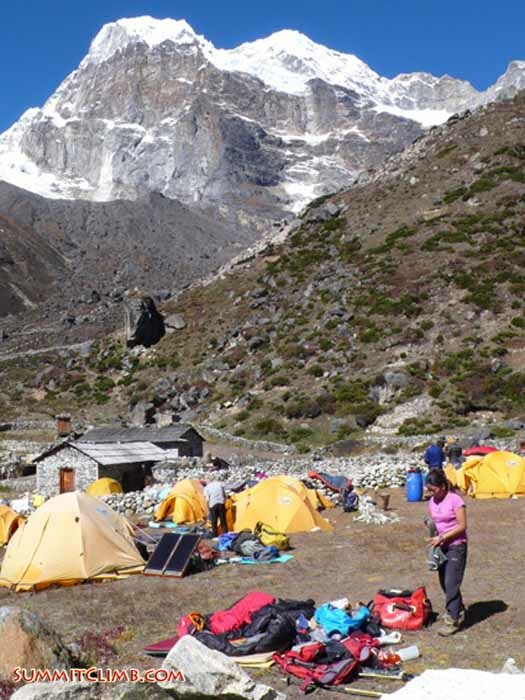 This is a warmer and better basecamp on the other side of the Mera La (Dan Mazur). Hello, good morning. 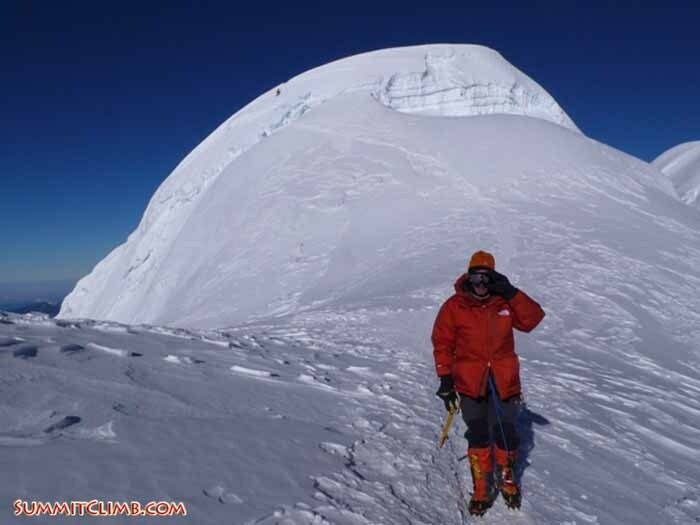 This is Jose Ferro calling in a dispatch for the SummitClimb Baruntse expedition on the 18th of October. This morning we are in Tagnag at 4200 metres/13,800 feet. Today is a much better day. For the first time we’ve had sunshine in the morning. We are having a late start with 2-3 days of lots of rain and snow, so today has been quite good. Later this morning we are going to Khare at 4700 metres/15,400 feet. We have been going through lots of fog and clouds, so this morning we could see the top of Mera Peak for the first time, which is about 2 kilometres higher than where we are now. It’s quite exciting. Now we can basically see the route we will follow for the next couple of days. We’re hoping for good weather. Now I’ll do a short dispatch in Spanish for all of those Spanish speakers out there (please click the audio link above to listen). Maya standing beneath Mount Kusum Kanguru. Sorting kit in Tagnag at 4500 metres/14,800 feet during our rest day. That's Kusum Kanguru behind (Dan Mazur). 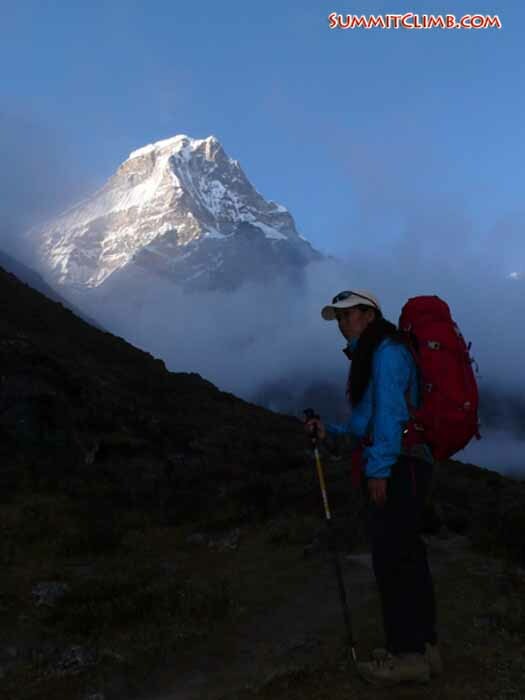 Hello, this is Jackie Cross on the Mera Peak trek. I say ‘Mera Peak’ because I’m one of the only 4 going to Mera Peak and not continuing on to Baruntse. I’m reporting from Khotey at 3350 metres, which we reached yesterday on the 16th. Yesterday it rained and it rained and it rained and it rained. When you could lift your head to look it was very pretty. We came down through lots of rhododendron forests and lots of streams, which turned into raging torrents and waterfalls. It was very muddy because of the rain. I hope it doesn’t’ rain when we come back this way. Our leader, Daniel Mazur, got us here much sooner than we expected, which was fantastic. We got here earlier than expected, lower than expected, happier than expected and a few of us got rooms, of which I was one of the lucky few. The main thing that made it really special when we arrived was the monkeys playing in the trees. First there was one, than there was a family. When they moved off there were about 20-30 of them playing around in the trees. Now that we are here we’re quite happy, dry, warm, and huddled around the heater inside trying to dry off all our wet clothes. Overall it was beautiful and hopefully will be just as much on the way back. We will set off to Tagnang today and hope it’s not raining. Keep your fingers crossed that we all get their safe and dry. 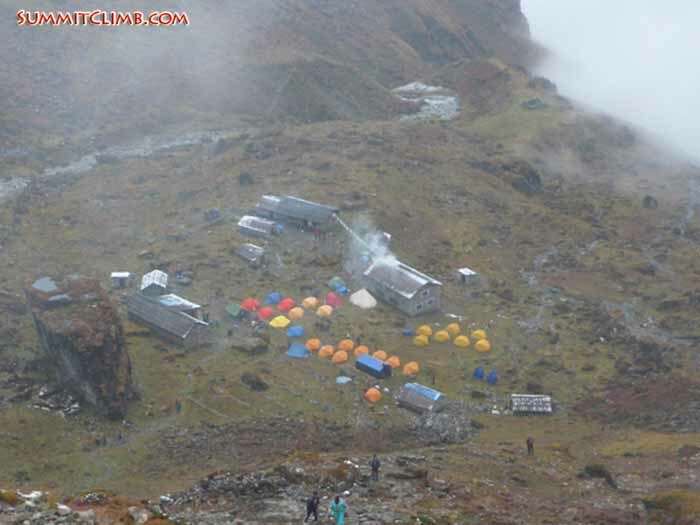 Looking down through the clouds at the 4200 metre/13,800 foot high encampment of Chetra la. Exploring the Khothey shrine. Maya and Jangbu traversing through the Kothey shrine to win a blessing. Packing up in the morning at Chetra la (Dan Mazur). 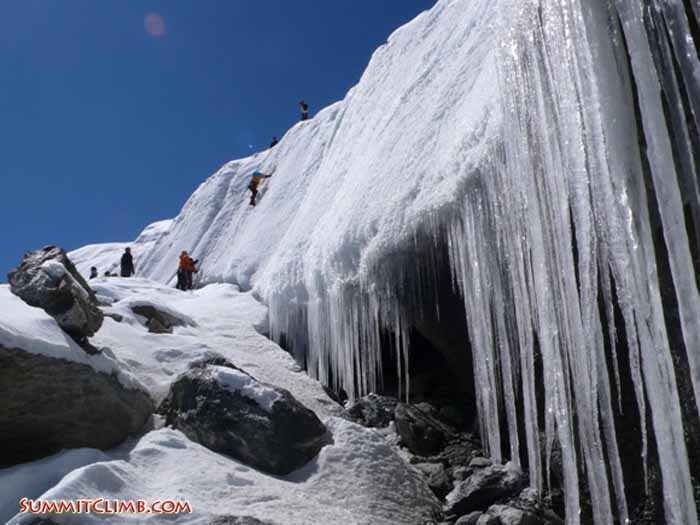 This is a dispatch for the SummitClimb Mera Peak/Baruntse expedition on the 15th of October. Chilling in the Namaste Lodge in the evening, a warm and comfortable teahouse. Looking up at the Zetra La pass from the streets of Lukla on a beautiful morning (Dan Mazur). 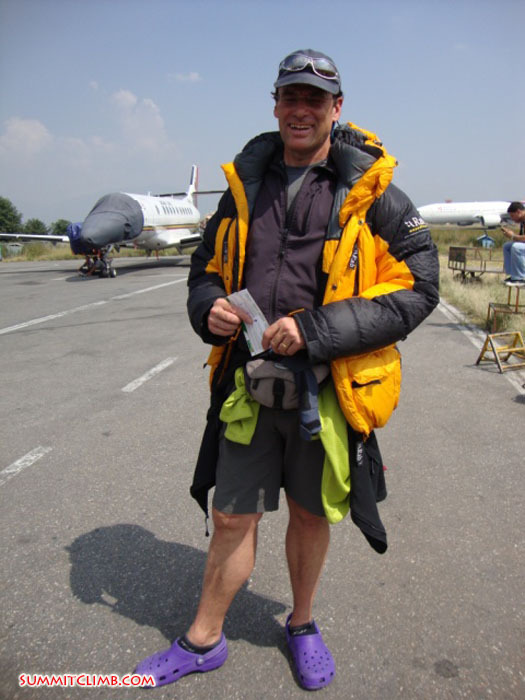 Hello, this is Andreas Hofer for the Baruntse expedition. Today is the 14th of October. Today we walked from Tukding at 3300 metres/10,700 feet to Khakitang, which is 4060 metres/13,300 feet. We walked through a little forest and bush lands up to a higher elevation, where there was no vegetation any more. It’s a very little town with only 3 houses. Our tents have all been set up very nice in our little comfortable camp. It rained overnight. Everybody is feeling well. I caught a bit of a cold in the beginning, but am getting better every day. Looking up at Mera Peak from Kothey (Dan Mazur). 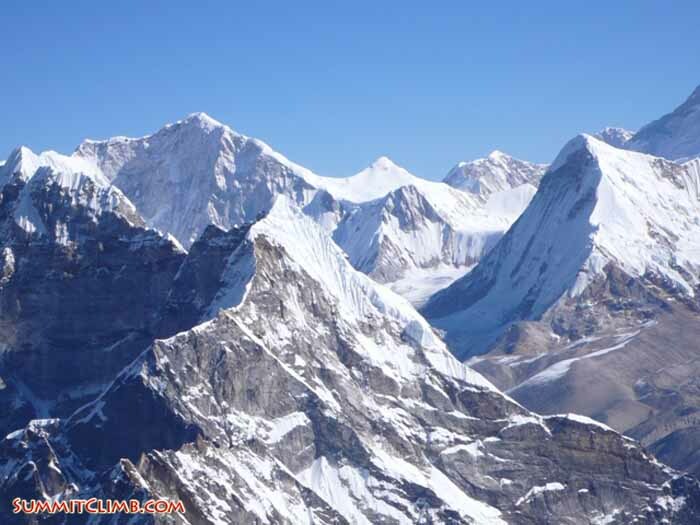 Hi, this is Ying Hsu with a dispatch for the SummitClimb Mera Peak/Baruntse expedition on the 13th of October. 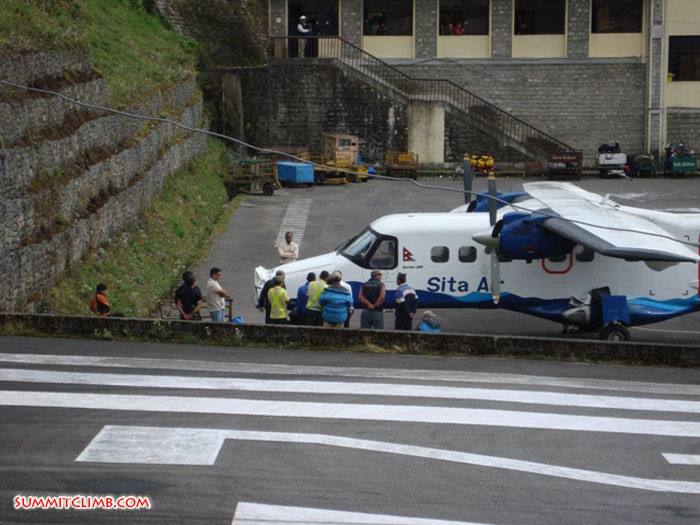 We started the trip finally from Lukla at about 2:30 p.m. after a long delay. 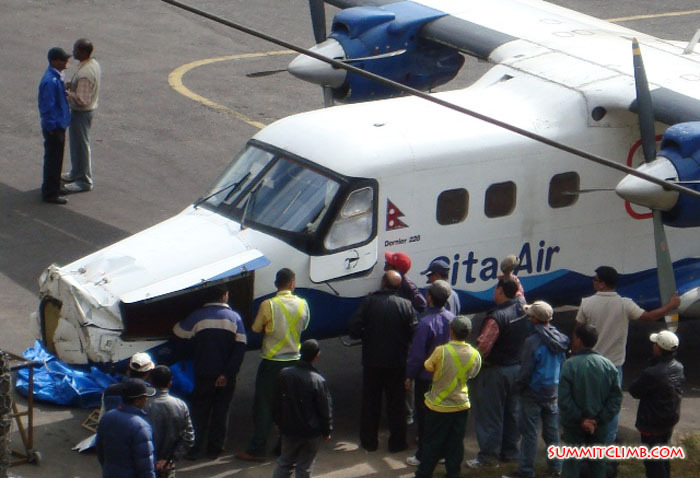 We had troubles getting from Kathmandu to Lukla with various flight delays, strikes and weather conditions. We’re glad the entire team except Felix is here. We hope he will make it here sometime soon. We miss him. We are also waiting on 2/3 of our luggage and we hope we see it sometime soon too. Between us, we think we have enough warm clothes and food. Everything is good. We started trekking about 2:30 p.m. and had a nice walk through rhododendron forests and dry hemlock trees. We arrived at a place called Tukding at about 5:30 p.m. at an elevation of about 3250 metres/10,660 feet. That was from an elevation of 2850 metres/9350 feet at Lukla. There was about a 400+ metre elevation gain. The group was all happy and well rested the next morning. No one has any altitude sickness yet. Everyone is relaxed and joking. It’s a good team. We’re going up to a village at an elevation of about 4200 metres/13,800 feet today, so it’s going to be a bigger day of about a 6-7 hour walk. The weather is cloudy at the moment, heavily overcast with us walking up into clouds of fog, but we hope the weather will clear. Facing south we can see several snow covered peaks and there is a tiny little bit of blue sky peaking through, so we hope we get to see some blue sky today. We’re about to have breakfast and head out. Now I’d like to do a separate dispatch in Chinese (please click the audio link above).